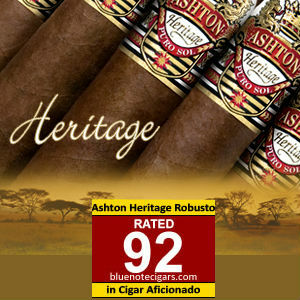 The Ashton Heritage Puro Sol is a cigar is as rich in tradition as it is in its deep satisfying flavor. It is such a marvel, that two legendary cigar families, the Fuentes and Meerapfels, shared an instrumental part in the creation of this fantastic cigar. Richard Meerapfel found what is now known to be Cameroon wrapper and is called "Puro Sol." In fact, this was the first time a Cameroon wrapper was ever used on an Ashton Cigar. With the Fuente Family's hand in blending and manufacturing and the African Cameroon wrapper discovered by Richard Meerapfel, the Ashton Heritage Puro Sol is a cigar for the ages.